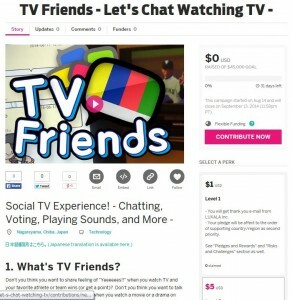 To reserve development budget toward production version of TV Friends, a project page was posted to INDIEGOGO, a crowd funding service site. The site is here. Crowd Funding Service is a service in which an indivisual or small company can call for small fund from other indivisuals. Kickstarter is a famous service as you might know. This time TV Friends decided to use the service to reserve a budget for adding more features, adding supporting countries/regions, and promotion fees toward production version. If you could support us, we are very appreciated, and you will get some rewards from us.